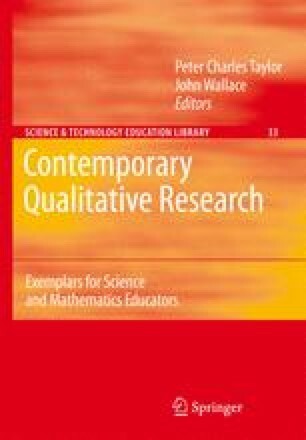 Qualitative educational research has evolved dramatically over the last 25 years, from early participant-observation studies painting descriptive portraits of happenings in classrooms to today’s multi-perspectival and critical reflexive studies employing literary devices to transform the consciousness of both the researcher and the reader. This exciting evolution has been wrought by pioneering researchers crossing disciplinary borders into otherwise alien territories (the Arts, Humanities, Theology, Quantum Physics, Philosophy) and returning with a rich array of innovative perspectives and methodologies. But along with the excitement of the new, comes serious challenges. Whilst new methodologies address refreshingly new research questions, the basic notion of what constitutes research, indeed ‘valid’ research, has become complex, confusing, and not a little confronting, particularly for novice researchers in science and mathematics education.